Random Thoughts » Disease or Bad Habit? You may know of someone who believes that alcoholism is a disease. Because of this, they feel that they are powerless before it. However, many medical experts are troubled by the fact that alcoholism doesn’t exactly fit the “disease model”. It does not, in their view, have the empirical evidence to back up this idea. Here are just 4 reasons that many doctors now reject the idea that alcoholism is a disease. Alcoholism is a risk behavior. 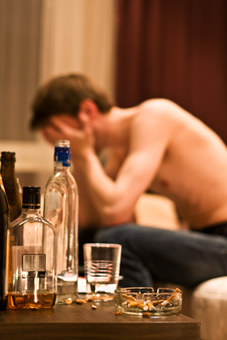 Alcoholism is a risk behavior that often LEADS to illness. It is not a disease in and of itself. Risky behaviors such as drinking and smoking often become addictive, which in turn can RESULT in an illness. Alcoholism is reduced by a conscious, voluntary decision by the one who drinks. When one CHANGES THEIR LIFESTYLE they are able to overcome their alcohol addiction. This is simply not true with biological diseases. Most people who have quit drinking have done so on their own, without medical intervention. This is not possible to do with other biological diseases. No one is “quitting” heart disease or HIV/Aids. Nor are they deciding that a certain illness “just isn’t for them”. The disease theory of alcoholism originated with a man who had some wacky ideas. This theory originated with Dr. Benjamin Rush in the early 1800’s. Dr. Rush ALSO believed that lying, murder, political dissent and being African-American were diseases. Here’s the truth: alcoholism is a very bad habit that you’ve allowed to control your life. It has wormed its way into your life because of the day-to-day habits you’ve adopted over the years. The good news is that you are fully capable of breaking this bad habit. You will take control of your life as soon as you commit yourself to changing your daily habits. You’ve broken bad habits before, and you will do so again.